Personalized Learning Technology has recently become of interest again to the education community. Interest in the technology was intense after the 2004 Grunwald study, in which 455 of the best thinkers in education identified Personalized Learning as the most promising and powerful application of technology in education. They observed that personalization could provide instruction that meets the individual needs of every learner throughout the entire learning process. BrainX’s Personalized Learning System fulfills this promise by providing the benefits of one-to-one tutoring coupled with both education and neuroscience research-based mastery learning strategies. A good definition of personalized learning technology is that it maintains a learning profile on each learner which contains information on how to personalize every part of the learning experience. Research shows that such personalization improves learning outcomes especially if it continuously adapts and improves. In short, the system acts like a professional live instructor who is providing one-on-one tutoring. Perhaps this is why the National Tutors Association has always been a strong supporter of Personalized Learning Technology and has selected the BrainX Personalized Learning System for all of their online training and certification programs. What is the difference between Personalized Learning and Differentiated Instruction? Differentiated instruction is one of the areas where research supports the benefits of personalization. Example: A differentiated instruction system can determine a curriculum path for a particular student; however, it does not necessarily adapt that path as the student progresses. Similarly, two students who have the same pre-assessment may be given the same learning experience, even if their rate or success in learning differs during instruction. A Personal Learning System would intelligently adapt instruction in response to a student’s progress. 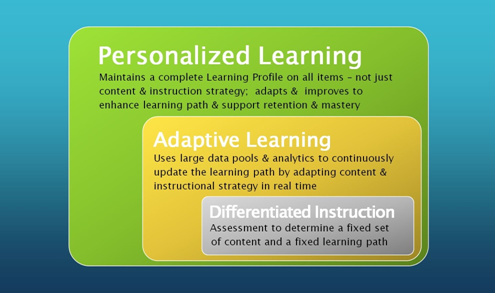 What is the difference between Personalized Learning and Adaptive Learning? Adaptive Learning picks up where Differentiated Instruction ends. It uses data and analytics to continuously adapt the learning path. For example two student who were initially on the same path may receive different lessons based on their previous work in the course. Differentiated learning systems make the assumption that each student is only partially unique and therefore the system can use analytics to place them in a refined category and then use historical information about what has worked for other students in this refined category. Personalized Learning Systems by contrast assume that each learner is totally unique. While they will use the same historical data and analytic process employed by adaptive learning they go beyond this to provide a higher level of personalization. 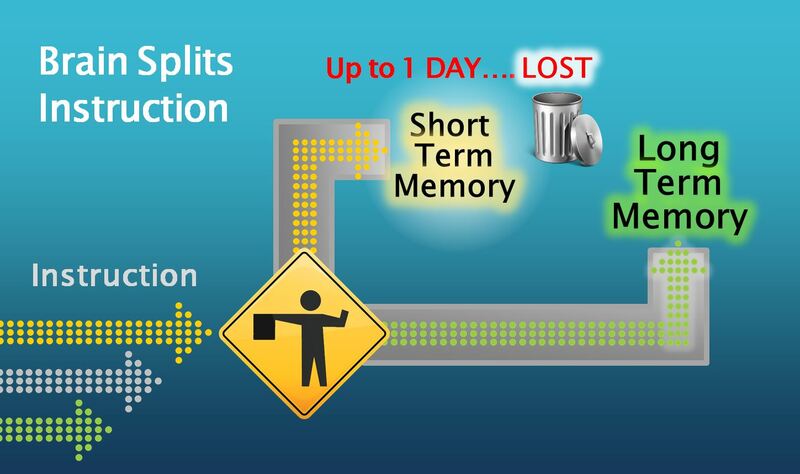 There are now over 100 years of research studying the science behind Forgetting and Retention – which includes the Spacing Effect. Students will forget most of what they learn in lessons if they don’t practice recalling the information over a number of days. 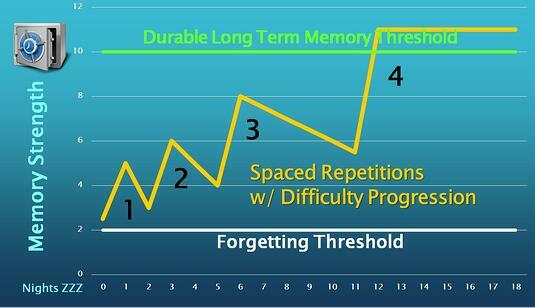 The research shows that spacing out the days between recall practice sessions while progressively increasing the difficulty of questions actually reduces the total number of repetitions and total amount of study time required to achieve durable long term memories. Both Adaptive and Personalized learning will use historical data and analytics to make initial assumptions about the most effective spacing sequence for an individual student. However the research shows that the exact spacing between sessions and the rate at which the difficulty should be increased is unique to each learner, and therefore, the application of this strategy must be personalized to each learner. To accomplish this Personalized Learning Systems will go beyond the initial assumptions to identify the specific spacing sequence that is best for each learner. At a minimum this extra level of personalization reduces study time while in some cases is the difference between students who succeed and those who almost succeed. By definition adaptive learning systems are limited to adapting content and learning strategies. Research shows there is more to improving student outcomes then what adaptive learning systems are able to provide. For example improving self-efficacy. Unlike either Differentiated or Adaptive Learning, Personalized Learning Technology tackles each of these non-content related issues on a personal level. And as new research uncovers additional ways to improve learning outcomes, Personalized Learning Technologists are the first to look for ways to integrate the research. One of the most important learning-related discoveries in the last two years is that the brain has something like a “gatekeeper valve” which allows or prevents instruction from reaching the brain’s Long Term Memory formation process. 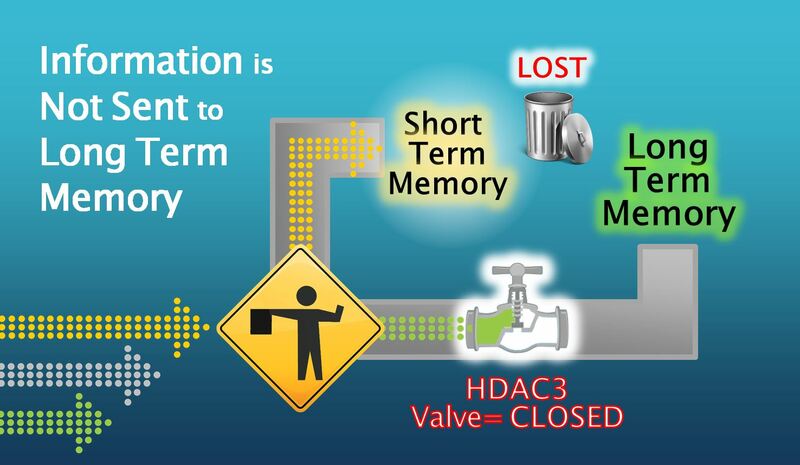 This valve is normally off, because 99 percent of the information the Brain receives in a day doesn’t need to be remembered past that day, so it is only sent to Short Term Memory. For example, you can go to the shopping mall, shop for several hours and still remember generally where you parked your car – however you can’t remember where you parked your car when you went to the store a week ago. 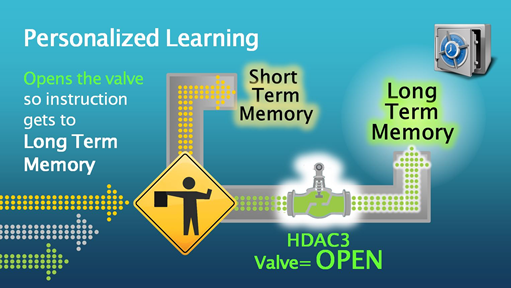 When educators talk about engagement, what they are really trying to do is open this valve to Long Term Memory formation, and keep it open. That’s why things like Gamification become hot topics in education circles. The trouble is that, aside from using drugs to suppress the neurotransmitter which keeps this valve closed, the strategies required to open the valve are unique to each learner. A Gamification strategy may open the valve for one student and slam it shut for another. In other words, it takes Personalization to ensure that the valve is open prior to every learning encounter. In summary, the concepts of Differentiated Instruction are incorporated into Adaptive Instruction, where things that are not supported by Differentiated Instruction are added to effect learning outcomes. Likewise, Personalized Learning Systems incorporate the concepts of Adaptive Instruction while adding things that affect learning outcomes that are not supported by either Differentiated or Adaptive Instruction.